How to Cook Legumes - Vegans Eat What? Vegans Eat What? The process for cooking dried legumes is so simple! If you’ve been afraid of trying this, follow the instructions below for perfect beans every time! The legume family includes beans, peas, and lentils. Note that small “cracked” legumes such as all colors of split peas and lentils do not need to be presoaked. For these types of legumes, skip the Soaking step below. First, “sort” the dried legumes. This means pouring them onto something flat (such as a cookie sheet or plate) where you can move them around, removing any small rocks, odd looking beans or bits of debris. Next, place the sorted legumes in a large container (plastic or glass) and add enough water so that they are covered with a couple of inches or more of water above the level of the beans. You cannot add too much water. Cover them lightly so that dust does not fall into the container. Let them soak overnight or at least 8 hours. Pour the water off of the beans and rinse them well. The soaking water will contain a lot of what causes beans to create flatulence, so do not use the soaking water and rinse them well. If you want to reduce flatulence further, rinse a stick or two of dried Kombu and either place it in the pot whole, or break it into pieces before adding to the pot. (Kombu is a seaweed that is found in health food stores, Asian grocery stores, and online. As it is dried, it stores for a very long time in your cupboard.) I prefer to break it up and leave it in the pot of beans as it adds rich minerals and creates a thicker soup. Your choice may depend upon what you plan to do with the cooked beans. Note that you may sauté onions and garlic in the pot prior to adding the beans if you choose. However DO NOT add any sodium – salt, soy sauce, canned tomatoes with sodium – no sodium at this stage. Sodium will cause the beans to cook slowly, may cause split skins, and if you live at altitude, your beans may take forever to cook or simply may never completely cook. You can add any chosen sodium once they are done. If planning a “pot of beans” of some type as a rich soup/stew, sauté the onions well, add garlic, chopped carrots and celery and then proceed to the next step. You may also add herbs and spices at this stage. Place the soaked beans into a large pot for cooking and add enough water so that the water level is at least an inch or two above the beans. Add herbs and spices if you didn’t prior to adding the beans. Bring the beans to a boil and then reduce the heat to allow them to cook at a low boil until they are done. The more water in the pot, the more the beans can roll and cook more quickly. Some people prefer to uncover the beans. I prefer to “half” cover them with the pot’s lid. Once the legumes are done (test them first), you may add anything with sodium such as canned tomatoes, soy sauce, salt, etc. You may also add other items such as spices, mock sausages, etc. There are many charts available in cookbooks and on the internet for cooking legumes. 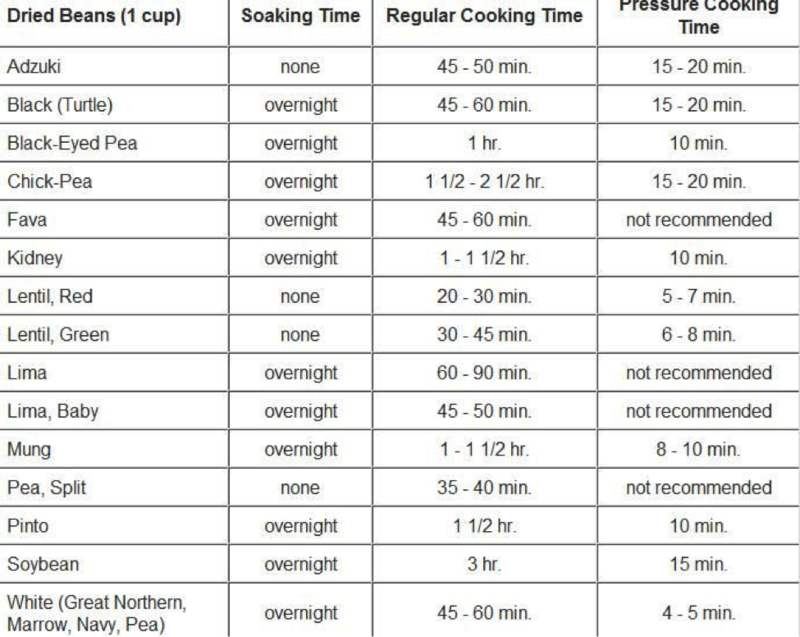 Below is a sample chart that includes cooking times on the stove top as well as pressure cooking times. We suggest that you allow additional cooking time if needed for your beans, especially if cooking stove top. Part of that suggestion is personal preference as to the “doneness” of the beans, part is the age of the dried beans (old beans take longer to cook) and part is altitude. This method of cooking beans is from our friend Sarah Gordon. We’ve had great success using Sarah’s method. There is not an exact recipe for making beans. Variables such as altitude, humidity, and bean types affect cooking times and water amount used. I have outlined the basic formula with a guideline recipe to follow. I highly recommend using a crock pot to cook the beans in. The crock pot cuts the cooking time in half and protects the beans from overcooking or burning. It also allows the cook the ability to leave the kitchen and not have to babysit the beans. High altitude climates require longer cooking times, usually around 4-6 hours. At sea level, beans take about 1-3 hours to cook. Pinto beans are a great beginner bean to try out. They have a shorter cooking time and almost foolproof results. Bring beans and water to a boil in large pot. Place heated beans and water in a crock pot of appropriate size. Turn heat to high, and cook covered. Lower heat if leaving the house or cooking overnight. Check on beans occasionally to make sure there is enough water. Beans need a lot of water to thoroughly cook. Add water as needed. Beans are done when they are soft and slightly mushy. Take beans out of crock pot and drain in colander. Rinse beans to get rid of impurities and gas causing molecules. Place cooked beans and enough water to just cover them in a pot. Now is the time to add salt to taste and any other additional seasonings; whole cloves of garlic and fresh sprigs of herbs such as rosemary, thyme, and oregano are delicious additions. Let beans simmer for an additional 30-60 minutes, in order to make a flavorful broth.